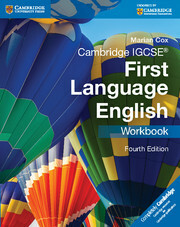 This standalone, photocopiable Cambridge IGSCE First Language English Teacher's Resource (fourth edition) provides a complete solution to teaching Cambridge IGCSE First Language English. It contains teaching resources not linked to the Coursebook or Workbook topics, so it can be used independently or to supplement teaching using the other components in the suite. It contains 28 themed units grouped into six parts focusing on the following skills: Reading comprehension, Writers' effects, Summary, Directed writing, Composition and Coursework. 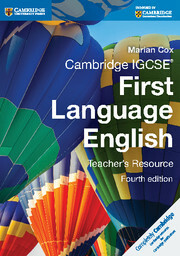 Cambridge IGSCE First Language English Teacher's Resource (fourth edition) includes practical advice for teachers as well as worksheets with answers and full lesson plans. A microsite provides free online resources to support the course. 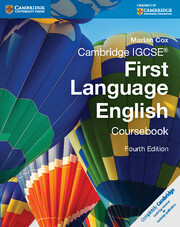 Fully updated to meet the syllabus change: Cambridge IGCSE First Language English (0500) Cambridge International Level 1/Level 2 Certificate First Language English (0522). A complete solution to teaching the course or for additional resource support. It provides complete support for teaching the syllabus with detailed lesson plans and any reading texts, worksheets and slideshows needed to complete these lessons. Unit 11. Sharks and crocs! Unit 28. Science or sentiment?